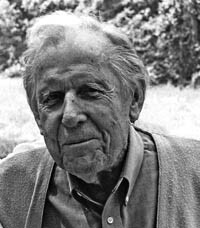 Thomas Berry (November 9, 1914 – June 1, 2009) was a Catholic priest of the Passionist order, cultural historian and ecotheologian (although cosmologist and geologian – or “Earth scholar” – were his preferred descriptors). Among advocates of "ecospirituality" and the "New Story," he is famous for proposing the idea that a deep understanding of the history and functioning of the evolving universe is a necessary inspiration and guide for our own effective functioning as individuals and as a species. He is considered a leader in the tradition of Teilhard de Chardin. Vegetarianism is a way of life that we should all move toward for economic survival, physical well-being and spiritual integrity. Reported in Food for the Spirit by Steven Rosen (New York: Bala Books, 1987), in the “Critics praise” section. We … wish especially to outline the conditions for entering a future that will lead to the larger fulfillment for which the entire planet, as well as ourselves, seems to be destined. The first condition for achieving this objective is to realize that the universe is a communion of subjects, not a collection of objects. The universe is composed of subjects to be communed with, not primarily of objects to be used. As a subject, each component of the universe is capable of having rights.